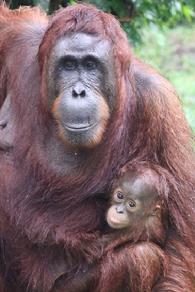 Today orangutans are found only on the islands of Sumatra and Borneo. Estimated numbers remaining in the wild are approximately 14 000 Sumatran orangutans (Pongo abelii ) and between 40 000 and 50 000 Bornean Orangutans (Pongo pygmaeus ). 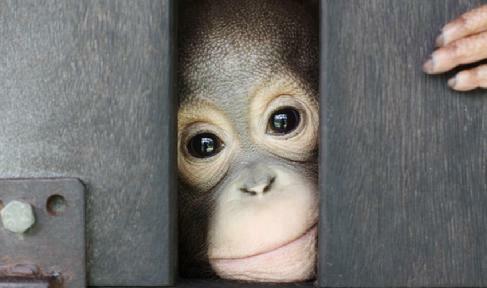 Both species are classified as Critically Endangered on the IUCN Red List. 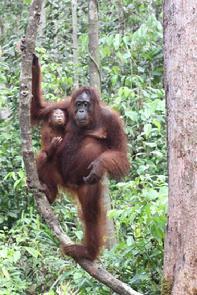 In the past decade it is believed the orangutan population has declined by 50%. There are a variety of factors which have led to this shameful statistic, most of which can be attributed to destructive human intervention. logging on a vast scale, both legal and illegal, has destroyed much of the valuable tropical rainforest which is the orangutan habitat. 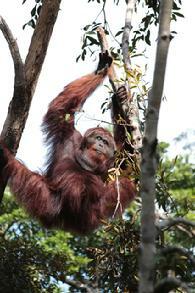 millions of hectares have been cleared for rubber and oil palm plantations, as well as farmlands and human settlements. mining and road construction has succeeded in fragmenting the remaining rainforest making it difficult for orangutan populations to avoid human contact. With their dwindling habitat, the orangutans sometimes stray onto nearby plantations in search of food, bringing them into conflict with man. poaching for the illegal and lucrative trade in wild animals and sometimes also bushmeat, has been facilitated by the creation of road networks through the forest areas. After brutally killing the mothers, the babies who cling to the mother for the first couple of years of their life, are torn from their arms and sold as pets. Natural disasters such as the devastating fires of 1997 and again in 2006, themselves the result of uncontrolled burning of agricultural land, were responsible for hundreds of orangutan deaths and the further devastation of thousands of hectares of rainforest. with the worldʼs ever increasing demand for palm oil, Indonesia, now the worldʼs largest producer of palm oil, is set to increase capacity in the coming years with more forest areas earmarked for destruction. Add to the above, the fact that orangutans have a very slow reproductive rate, (an average of 3 babies in a lifetime) and it is not difficult to understand why they face extinction. At the Orangutan Care Centre and Quarantine near the town of Pangkalanbun, Indonesian Borneo, more than 330 orphaned orangutans are being cared for. 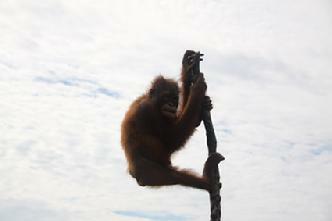 The Centre was established, and is run by the Orangutan Foundation International (OFI - www.orangutan.org). Orangutans are brought to the centre after having been confiscated from individuals keeping them as pets, or rescued from plantations or from fires. Some people bring them in voluntarily when they get too big and strong to keep as pets any longer. The rehabilitation of these orangutans to the point where they can be released back into the wild, is a long and painstaking process, which varies depending on each individualʼs circumstance. Some spend as long as 7 or 8 years at the centre. 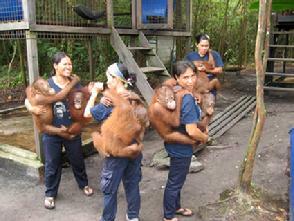 This is only one of several such centers which are continually receiving new orphaned or displaced orangutans. They all are faced with the same huge challenge: - will there be any suitable rainforest left into which they can release these orangutans once they have been rehabilitated? Photos on this page were taken at the Care Centre near Pankalanbun, Indonesian Borneo.